While trading some emails with Aaron Maller recently he mentioned that he observed that he could create circuits for nested shared electrical families. I don't recall Autodesk publicly taking credit for adding or allowing this behavior but I find that it has been possible as far back as the 2012 release. I'd try earlier releases too but I don't have them installed anymore. Since I started preparing this post I've discussed it with Jose Fandos and he confirmed that it is possible in 2011 too. I'm a bit frustrated because I thought I tried to explore this possibility a couple years ago while making some electrical content. Rather than dwell on what I thought wasn't possible I'll focus on what IS possible instead. Experience tells us there are many components that have a variety of options or configurations that can prove difficult to include connectors in, for example a boiler with its electrical panel available either on the right side OR the left side. When a single connector is placed we are inclined to placing it in the "middle" so we can "connect" it to a power supply. That's easier to accept for electrical connections but not as easy for piping or duct. When the connectors are native, placed directly in a family, it isn't possible to put two connectors in place but disable one or the other. Revit sees both even if we only use one of them in the project. With two connectors in the model we can define where connections take place more accurately but ultimately we end up with one valid connector (connected) and another lurking as "unassigned" within the system browser. It might not a big deal but Revit's developers encourage to assign everything to systems so this approach means there will always be some we can't assign properly. 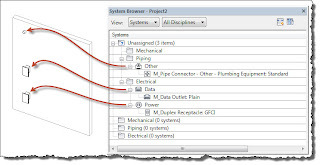 If the connector is part of a nested shared family and this nested family is assigned a Yes/No parameter to control its Visible parameter we gain control over not only when it is visible but also whether or not Revit sees a valid connector in the host family when it is loaded into a project. This is a crude example with connectors for pipe, electrical and data circuits, offering a conceptual right and left configuration. When I use a yes/no parameter to control the visibility of the nested families it is interesting to find that the system browser responds to their condition. 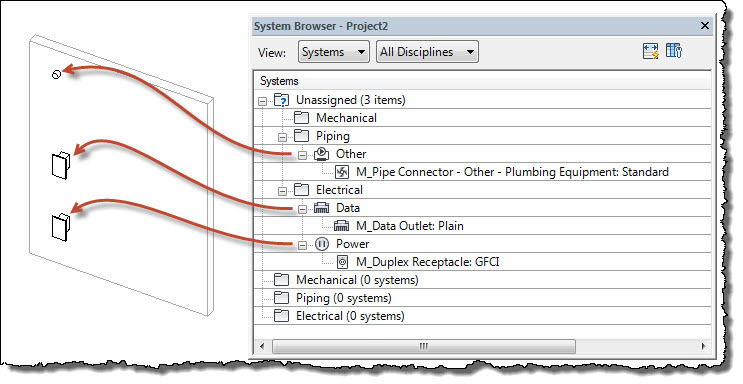 As can be expected Revit will delete a circuit or system associated with a nested connector if we choose to turn it off. So far I find that I can create systems, connect pipe and duct, draw wires as well as tag the nested shared families. This means that it may be a bit easier now to define a component that has multiple circuits. 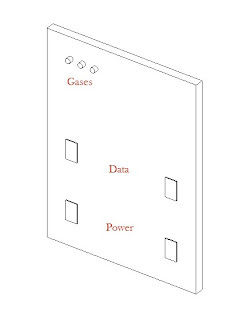 This can help counter the limitation that a family can only report circuit information (in a tag) for the primary connector when multiple connectors are in a family. Nested families with connectors are harder to see and therefore are harder work with. The connectors are only visible when you hover over the location where they are when you are using the appropriate tool, like duct, pipe or wire. That also means we can't use the convenient right click "create pipe/duct/wire" options because we can't see the connectors. 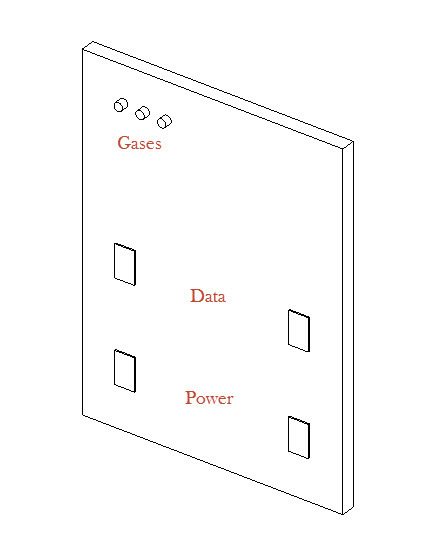 It may also confront us with a need for sub-categories for connector geometry, not for the connectors themselves but any forms we use to host them. It can be easier to find the connectors if we can see the hosting forms but we may not want to see them in every kind of view. Ultimately I think it's worth exploring further. Perhaps you'll agree? I concur. Great post Steve! it isn't perfect, but I guarantee this tip has saved me quite a few headaches with the multi-circuit equipment. Thanks for exposing this to us. It's better BIM than any other work-around I've had. It is interesting to know that this is possible, but I find it not really useful, because the only one who knows the whereabouts of the hidden connector is the family maker, and he/she is usually not the one is going to use the families. It's kind of hard to hover around a 3d family trying to find a ghost connector that nobody can see. It's not even detected by "Connect into". I wish that the developers at the factory could provide us with a way to hide connectors with a simple yes/no visibility parameter in the family, so that we don't have to do workarounds that are not user-friendly, like this-one. I haven't checked this feature in a while either, but I remember I was able to circuit multiple connectors, but I was only able to tag one of the circuits. Not both. Trying to find a way to tag the other connector. Definitely worth epxloring. Even conduit works with this method. As to the visibility of the connectors and knowing where they are for the end user, one could add some model lines to define where they are (ex: circle). The big drawback is the inability to access right-click options, as you pointed out in the post. I’ve recently discovered that connectors in nested families and I’m fairly certain this relates to groups too, appear to affect the extents of an overall family or group within a project file. Removing the connector from the families eliminates this and the issue. Is anyone able to explain what is happening and if there something that can be done to avoid this? it in turn effects the selection of the family or group when using a selection box method. Any help, insight or just general wisdom would be greatly appreciated. Turning off the connector with a visibility parameter fixes the bounding box issue. Donovan - Turning off the connector with visibility parameter? Are you asserting that is possible now?